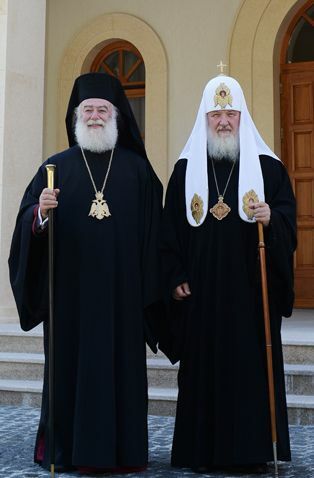 His Beatitude Patriarch Theodoros II of Alexandria sent a letter to Patriarch Kirill of Moscow and All Russia in which he expressed his concern about the increasing number of actions against the Russian Orthodox Church, reported the Public Relations Branch of the Department for External Church Relations on Saturday. “With untiring interest and deep concern we have seen in recent months this unpleasant phenomenon, the increase in the number of actions aimed against the most holy Russian Orthodox Church and the Orthodox faith. And this happens along with the widespread discrimination against Christian communities”, notes the Patriarch of Alexandria Theodore II in his message. “We are especially concerned about the fact that this aggression is also expressed by cases of vandalism in the places of worship”, his Beatitude said. “Heated manifestations of religious violence have extremely negative social and psychological effects on the local level due to the highly responsive mass media. And in addition, these events overshadow the notions of Russian national culture being noble and pious, adorned by numerous saints. These phenomena are a complete distortion of the concept of all religious traditions designed to reconcile the people”, the message says. “We express our strong support to your venerable Holiness, the Holy Synod and the fullness of the Holy Russian Church, praying with all our hearts for the good things, prosperity and welfare of the blessed and noble Russian people. May the winds of immorality stop blowing immediately”, concludes his Beatitude Patriarch Theodore II.